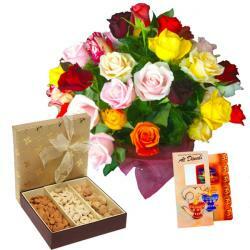 Product Consist : Bouquet of 15 Mix Seasonal Flowers and Box of Assorted Sweet (Weight : 500Gms) with 3 Kg Mix Seasonal Fruits In Basket 1/2 Kg Chocolate Chip Cake along with Diwali Fire Crackers (Worth Rs. 300/-) (Note: Firecracker will be deliver as per their availability no specific choice for it). Diwali celebrations are incomplete without lighting firecrackers. 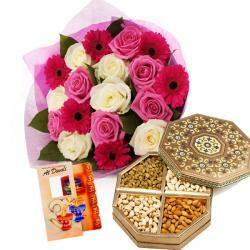 This Diwali send a complete Diwali special hamper to your dear ones to make them feel loved. 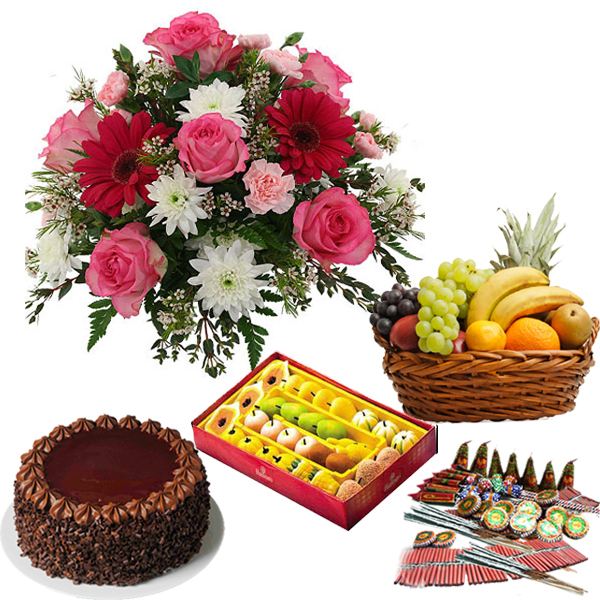 This is a special gift combo comprising of bouquet of 15 mix seasonal flowers along with healthy juicy fresh fruits and delicious mix mithai half kg chocolate cake in round shape exciting fire crackers worth Rs. 300 and a Diwali greeting card with lovely message for your dear ones. 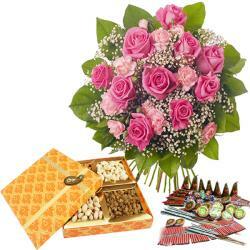 This mind blowing gift hamper is a perfect way to delight your loved ones and send them your Diwali wishes in style. 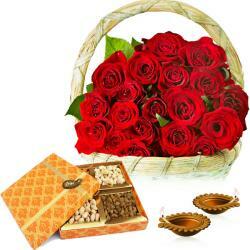 Product details: Product Consist : Bouquet of 15 Mix Seasonal Flowers and Box of Assorted Sweet (Weight : 500Gms) with 3 Kg Mix Seasonal Fruits In Basket 1/2 Kg Chocolate Chip Cake along with Diwali Fire Crackers (Worth Rs. 300/-) (Note: Firecracker will be deliver as per their availability no specific choice for it).